A total of 125 genes have been identified by researchers as playing a key role in a wide range of physical and behavioural traits promoted through selective breeding to give rise to the domesticated horse. The domestication of the horse revolutionized warfare, trade, and the exchange of people and ideas. It is a process that has been unfolding for at least 5500 years, which has transformed wild horses into the hundreds of breeds living today. The international team of researchers zeroed in on the 125 candidate genes by comparing the genomes of two ancient horses with those of the Przewalski’s horse and five breeds of domesticated horses. To complete the work, the researchers sequenced two complete horse genomes that predated domestication by many thousands of years. By comparing the genomes, they found positive selection for genes in domesticated horses involved in various aspects of locomotion, physiology, and intelligence. One group of genes they identified is involved in muscular and limb development, joints, and the cardiac system, and may represent physiological adaptations for human use. A second group comprises genes with cognitive functions, including social behavior, learning capabilities, fear response, and agreeableness, all of which may have been crucial in taming horses. However, on the downside, they found that modern horse genomes contained an excess of harmful mutations, which they characterised as representing the genetic cost of domestication. This genetic load is in line with the “cost of domestication” hypothesis also reported for rice, tomatoes, and dogs. It is generally attributed to the relaxation of purifying selection resulting from the strong demographic bottlenecks accompanying domestication. The researchers, across a dozen international universities, suggested that a significant part of the genetic variation in modern domesticated horses could be attributed to interbreeding with the descendants of a now extinct population of wild horses. This population was distinct from the only surviving wild horse population, that of the Przewalski’s horses in Mongolia. The Przewalski’s horses descend from a mere 13 individuals, preserved only through a massive conservation effort. As a consequence of this massive loss of genetic diversity, the effects of horse domestication through times have been difficult to unravel on a molecular level, said Dr Ludovic Orlando, an associate professor at the University of Copenhagen’s Centre for GeoGenetics, who led this work. The usual way to evaluate the evolutionary impact of domestication involved comparing the genetic information present among wild animals with their living domesticates. This approach was ill-suited to the minimal diversity in the remaining Przewalski’s horses. For that reason, the researchers decided to sequence the genome of ancient horses that lived prior to domestication to directly assess how they looked genetically. In 2013, Orlando and his team had succeeded in decoding the genome of a 700,000 year-old horse, which still represents the oldest genome sequenced to date. This time, they focused on bone specimens dating from about 16,000 ago and about 43,000 years ago. They were excavated in the Taymyr Peninsula region of Russia, where arctic conditions favoured the preservation of DNA in ancient specimens. With the genomes mapped of the two ancient specimens, they compared them to those of the Przewalski’s horse and five breeds of domesticated horses. This led to the identification of the 125 candidate genes for traits most likely favoured through selective breeding. Their comparison also revealed that the ancient individuals contributed a significant amount of genetic variation to the modern population of domesticated horses, but not to the Przewalski’s horses. 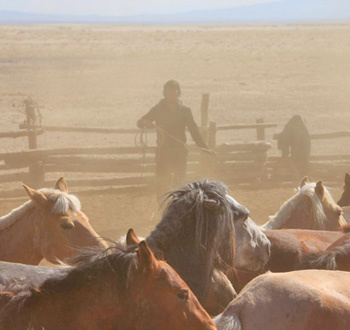 This suggested that restocking from a wild population descended from the ancient horses occurred during the domestication processes that ultimately led to modern domesticated horses. “Our estimate suggests that at least 13 percent, and potentially up to as much as 60 percent, of the modern horse genome has been acquired by restocking from the extinct wild population,” said Mikkel Schubert, a doctoral student at the Centre for GeoGenetics. “That we identified the population that contributed to this process demonstrates that it is possible to identify the ancestral genetic sources that ultimately gave rise to our domesticated horses,” Schubert said. The research team’s findings have been published in the Proceedings of the National Academy of Sciences.